Nullam iaculis pellentesque augue, sed tempor arcu dapibus vel. Our Hotel has 28 guest rooms. 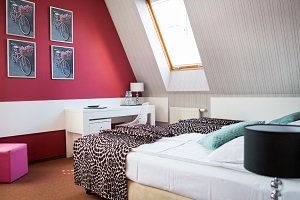 We offer single, double and triple rooms. Please note that smoking is strictly forbidden on the Hotel premises. a complimentary bottle of mineral water. At our Hotel, check-in time is 13.00, and check-out time is 11.00 the next day. If you travel by car or motorcycle, you can park your vehicle either on our car park in front of the building (protected by surveillance cameras) or in our underground garage. To meet the expectations of our Young Guests, at your request we can provide a cot/crib and bedding. Young Guests can also visit our playground.